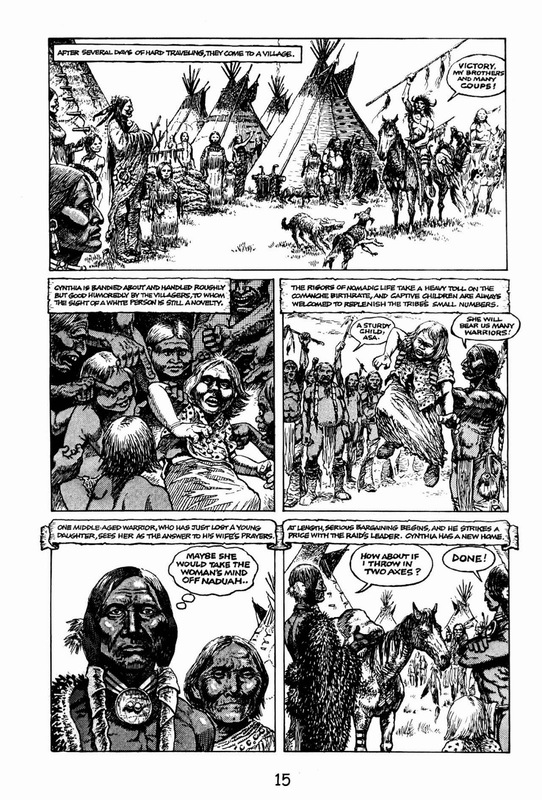 Comanche Moon is a wonderful historical graphic novel that really belongs in everyone's collection. 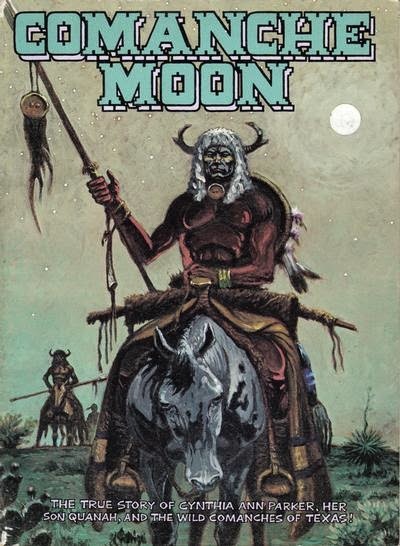 Published by Last Gasp in 1979, it's the true story of Cynthia Ann Parker, a white girl kidnapped and raised by Comanche's, and her son Quanah, who grows to become the last chief of the tribe. 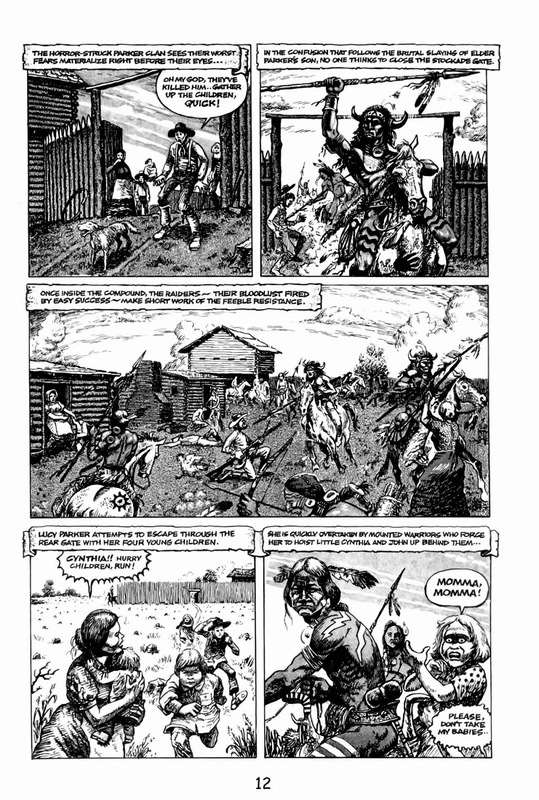 Underground artist Jack Jackson had tackled the history of his home state of Texas before, in strips like Nits Make Lice ( Slow Death #7 ), but this was a quantum leap forward from that early, explicitly violent underground classic. The mood is objective, rather than sensationalist, and any violence happens offscreen. It does take a while to get used to the distance Jaxon has here as a writer, as he deliberately doesn't get inside these real people's heads, but instead presents the facts just as they happened. A neat idea also is how the characters occasionally talk in modern day slang, as well as commenting wryly on the narration above their heads, making this anything but a dry history lesson. 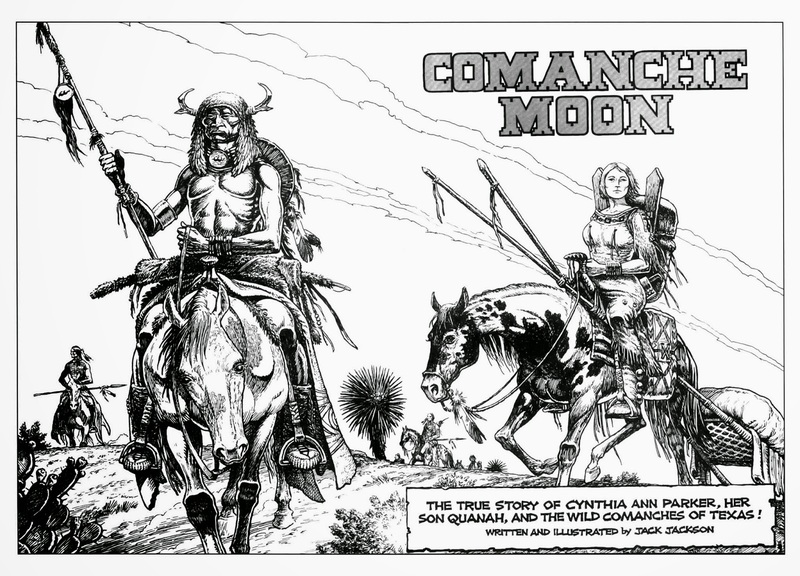 Plus Cynthia ( renamed Naduah by her new family ) and Quanah can't help but be fascinating characters, and Comanche Moon is literally unputdownable from start to finish. If there's any fault, it's that the sweep is sometimes too vast to follow, but you're always brought back to Quanah, and his incredible life story. 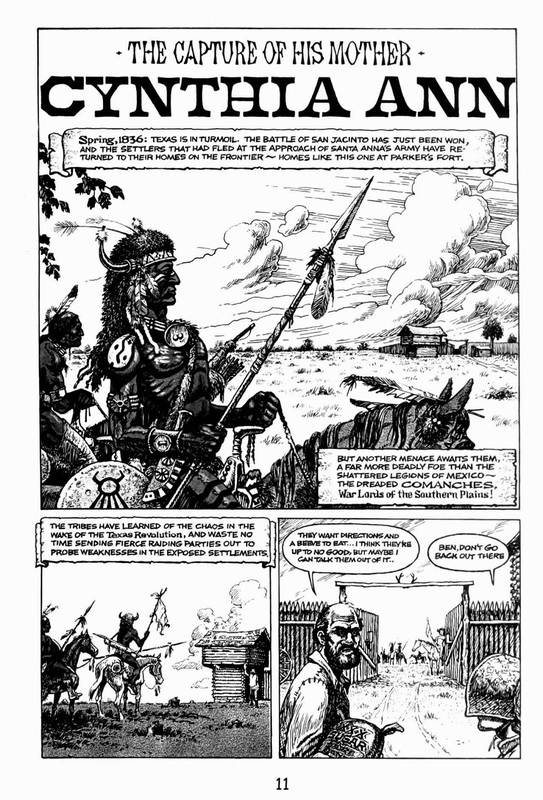 As an artist too, Jaxon approaches John Severin in places here, in terms of realism and feel for his subject. He also somehow gives the indian characters' completely expressionless faces real expression and emotion throughout. Here's the first couple of chapters as a teaser. You'll want to read on..
Beautiful work. 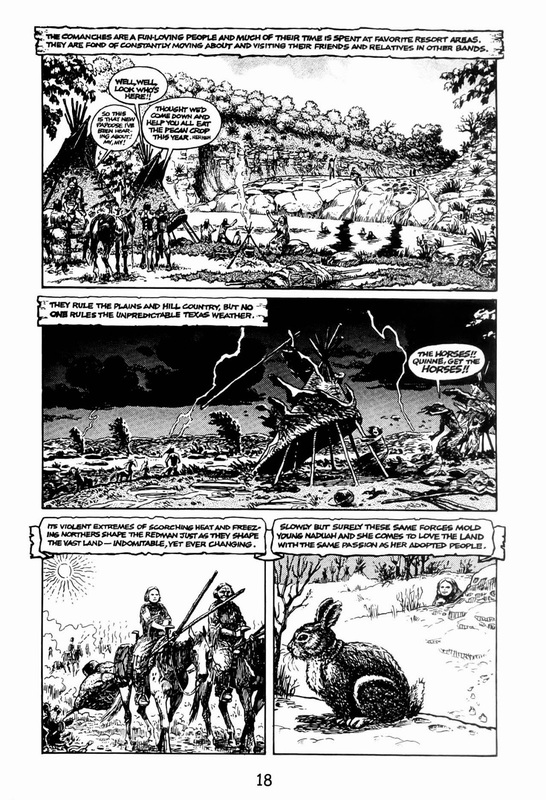 I know there was a bit of a tradition in popularizing Texas history, but I think Jaxon was also inspired by the historical work Harvey Kurtzman did in EC's Two-Fisted Tales. 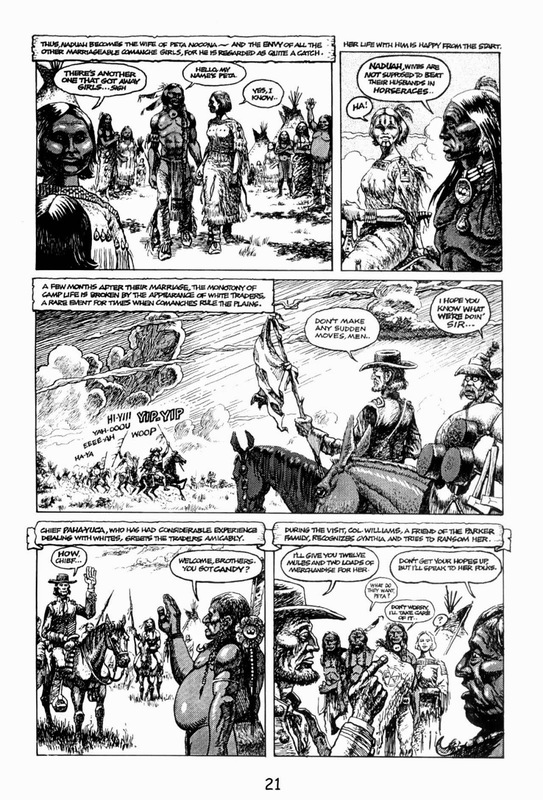 It still seems history is largely an untapped source for comics, where a good writer could exploit true stories that have the scope of a novel. 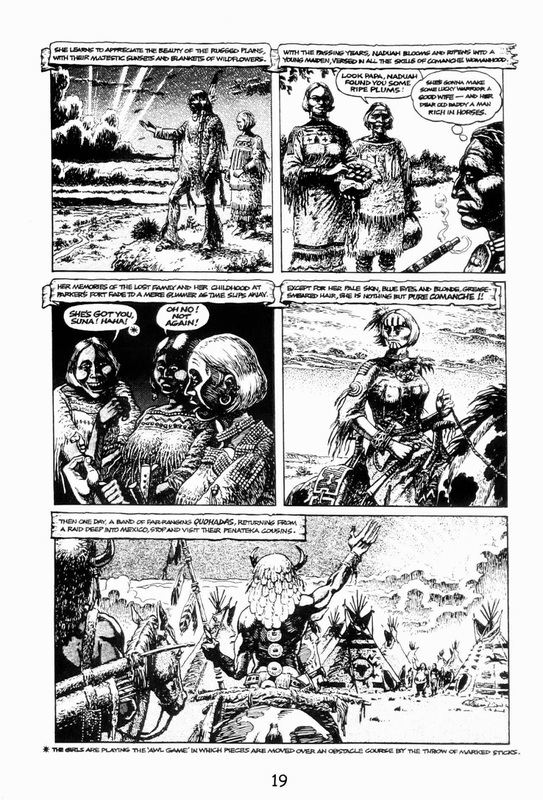 At one time, Alan Moore was planning to do a comic book about the life of Aubrey Beardsley, which might've been a visual feast. 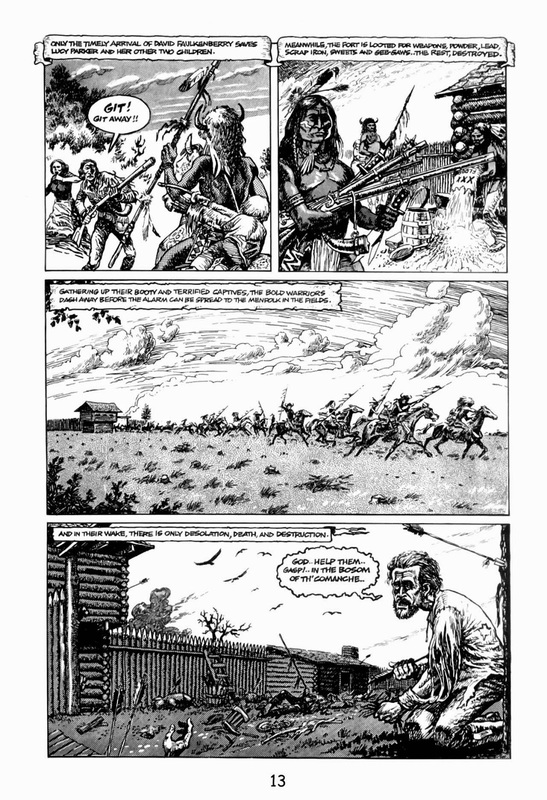 Comic creators should perhaps take a look at all of the masterpieces of cinema that pull from history. 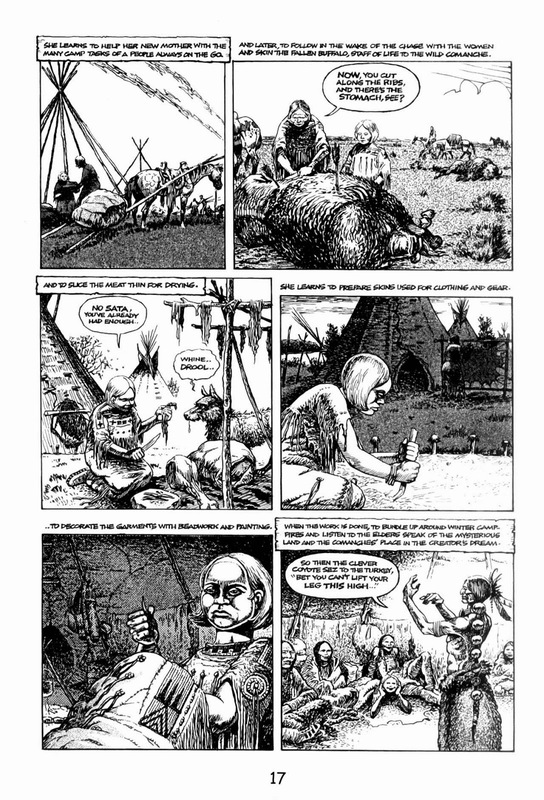 Absolutely, wish I could post Nits Make Lice ( the comic equivalent of the last reel of Soldier Blue ) but it's way too gory even for this site! Love Jaxon's historical stuff tho' and a shame it's not more recognized. Lois Lane In: Indian Death Charge!